My sleigh bells are ringing! I cannot believe we are nearing the end of the summer! Much to the frustration of many shoppers, the Christmas ranges will soon be in the shops… for me, it’s the culmination of 9 month’s work to bring our puddings to the shelves so I am getting very excited. The challenge now is forecasting enough stock to make sure new and existing LillyPudlians are able to buy a pud. I want to make sure your Christmas meal is complete with our festive delight! Close to home, our exposure across the county has increased dramatically with most areas now covered. 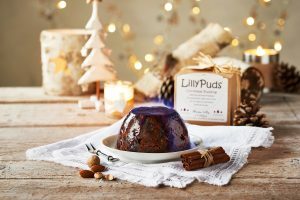 LillyPuds will have a presence in the Chelmsford Star Co-op premium stores and other new customers include Perrywoods at Tiptree and Suffolk Food Hall. Delighted at the prospect of serving these and all our new and existing outlets. Sincere thanks for supporting us as a small producer. Our first major trade shows are also almost upon us. The work that is involved with setting up for these events and ticking all the boxes is far more than I expected. I keep saying to myself that it can only be easier next time! We start with the Speciality Fine Food Fair at Olympia from 3rd to 5th September followed by the Top Drawer gifting fair from 10th to 12th September, also at Olympia. This marks an exciting time for LillyPuds – who knows who we will meet and hopefully new business relationships will be forthcoming. Prior to this, LillyPuds will be at Food for Thorpe this bank holiday weekend. The LillyPuds sleigh is looking forward to another outing – just not sure where Rudolph has disappeared to! Never too early to get that Christmas pudding bought….. one thing ticked off the list! And not forgetting that Sticky Toffee Pudding to eat now! I am still eagerly awaiting the outcome of the Great British Food Awards. LillyPuds Traditional Christmas Pudding has been shortlisted as one of the final 10 products in the Sweet Bake Category and albeit not shortlisted, LillyPuds Gluten Free Christmas Pudding scored 16 out of 20! Your support and feedback has been amazing! Please do keep in touch on Twitter and Facebook for our latest news. I will be blogging again in September with my autumn round up. Happy holidays LillyPudlians – the sun is shining!